Sugar Valley Craftsmen are a group of artisans with wide-ranging interests and creative activities. Currently, there is active work taking place in pottery, woodworking, painting, weaving and multimedia production. ​Sugar Valley Craftsmen, as a group, are committed to both developing and refining our own skills in our crafts, and to sharing that knowledge and training with other interested individuals and groups. Would you like to learn a skill that could be for your own enjoyment or your own entrepreneurial business? From workshops to individual apprenticeships, opportunities are available to share in the joy of creative craft work. Interested individuals of all ages are encouraged to contact SVA for more information about Sugar Valley Craftsmen opportunities. Anyone, whether you are just entering the world of art or are already more experienced, is welcome at SVA to paint, sketch, draw and create in a beautiful setting and supportive atmosphere. There is always an opportunity for instruction, collaborative work, as well as simply coming together to share an appreciation for the magic of art. If you are intrigued by the potential for creativity offered by pairing imagination with "modern tools" that can be used to tell a story, communicate an idea, and explore new creative horizons, then this aspect of Sugar Valley Craftsmen is just for you! Video, photography, graphic design, computer graphics, audio production, drone experimentation, publishing, and website design are areas of ongoing exploration, learning and development here at SVA. The emphasis is laid on collaboration, building on each other's ideas and skills, and bringing to life effective, purposeful communication. Sugar Valley Craftsmen are blessed with a large, well-equipped woodworking shop. Individuals who are interested in learning the basics of woodworking whether it be furniture construction, scroll saw work, turning bowls and other items on the lathe, and more, are welcome to contact SVA. 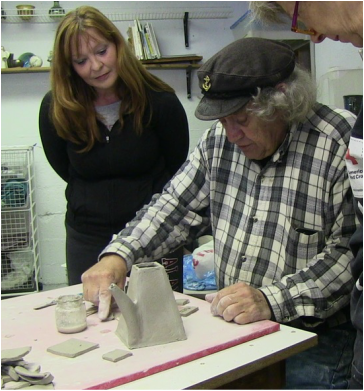 Sugar Valley Pottery Studio is well-equipped, with many hand building tools, including a slab roller, and 2 electric wheels. For firing, we have a small and a larger kiln, and access to a raku kiln with a local artist, who leads raku workshops in the studio. Children and adults create many useful and decorative pieces, and enjoy the magic of giving form and color to clay. Ready to explore your creative side?